A statistic that continues to perplex me: 86% of tanning bed users acknowledge that tanning causes cancer, and yet they do it anyway. A reality that continues to perplex me: The number of people I'm friends with who continue to tan even though they know I've had melanoma (it's surprisingly high). 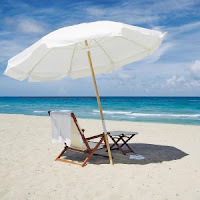 I realize that not all cases of melanoma are caused by UV radiation--natural or artificial--but some of them are. Yesterday, my dad sent me an article from CNBC.com that reiterates what I'm always saying about tanning and skin cancer: "Despite piles of research on the skin cancer risks of sun exposure and tanning beds, dermatologists and cancer groups struggle to persuade people to protect their skin from ultraviolet rays." We know what we're doing is bad, and yet we do it anyway. It's like some sort of skin cancer paradox, isn't it? If you're unfamiliar with recent findings, statistics, and legislation on melanoma, the CNBC article gives a great overview. I've read many of the studies it references in their entirety. I also love the suggestion from the University of North Carolina dermatologist at the end of the article: "Changing public opinion may be more effective than legislating change [for young people]. Effective campaigns to prevent skin cancer may need to emphasize that skin is most beautiful and healthy in it's natural, untanned, state." P.S. Best of luck to my girl Chelsea Price who is speaking at the uber-fancy Skin Cancer Foundation Gala this evening. 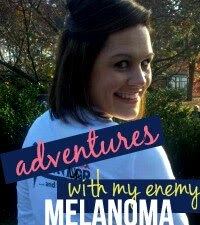 Besides hobnobbing with the rich and the famous, Chelsea will be sharing her experience of what it's like being a Stage III melanoma survivor in her mid-twenties. I hope that people pay attention because Chelsea isn't an anomaly. Melanoma isn't just an old person's disease anymore, and by limiting our exposure to harmful UV rays, we may be able to reduce the numbers of young people diagnosed with this crappy, crappy disease. Wonderfully said Katie. And Chelsea will do a grand job tonight! I think that a still too high percentage of young-er people still have that old "it'll never happen to me" thing going. I too believe that a huge help would be well loved models and celebrities and magazines featuring natural skin in its pale glory AS THE NORM would be helpful. One of my daughters said that campaigns putting the focus on tans being UNcool would do the trick. No young or young-er person wants to be UNcool.